2 drawings on paper (1 sheet) : ink ; 9.5 x6 in. 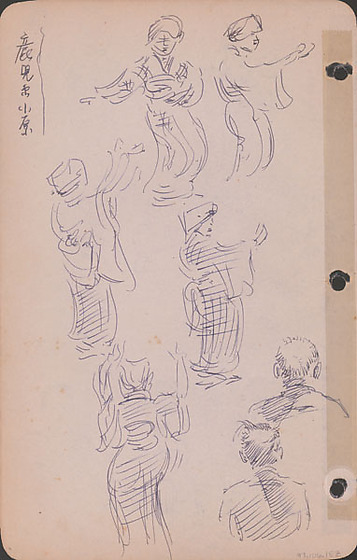 Ink sketches of five women dressed in kimono dancing and the back of a men's heads. Top row sketches of two women dancing facing the front and right. Middle row sketches of two women facing right. Bottom row left sketch of a women's back with arms raised overhead. Bottom row right sketches of of the backs of two men. Drawing 97.106.1EU on recto of same sheet. Written in black ink, top left (In Japanese): Kagoshima Ohara bushi.